1969 To Today . . . The More Things Change . . .
America where are you now? Don’t you care about your sons and daughters? OK, here is a question for you – Do you think William Shakespeare is rolling in his grave? No, really. Cee Lo Green DID base his “F**k You!” on one of his sonnets. Just sayin’. Erik Didriksen’s “Pop Sonnets” is based on the 1743 works of Sir Kirk de Edin who transcribed a small percentage of Shakespeare’s lesser known sonnets to the written word. While many may have been lost over time, as Shakespeare wrote thousands of unpublished sonnets during his lifetime – a lifetime that included the “Great Plague” of 1667 to 1666, and may have led to the loss of much of his work – de Edin rescued as many as he could. This collection is wonderful for its revelation of sonnets of the master you may never have heard of – but it is also a screaming riot when you realize just what songs have been based on the sonnets! From the aforementioned Cee Lo Green piece, to artists such as The Animals (House of the Rising Sun), Black Sabbath (“Iron Man”), Michael Jackson (“Thriller”) and, yes, The Village People’s “YMCA” (!) and Nena’s “99 Luftballoons” to works by Buddy Holly, Tommy Tutone, Frank Sinatra and, yes, John Travolta and Olivia Newton-John (giggle) this is a funny, quirky, fascinating look into a modern take on the Bard’s work. Grab it, enjoy it – and if you are like me? Go make a mix playlist of all the songs, in order. I can’t Wait! 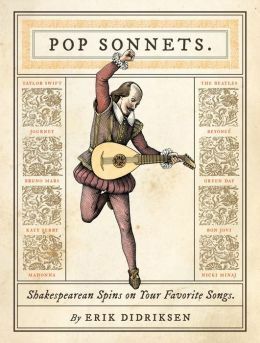 I received “Pop Sonnets” from the publisher in exchange for a realistic review. All thoughts are my own. If you enjoy my review, please click “Like” on Amazon. It helps both me and my authors! Thank you. There is snow on the ground (again) and it is cold and wet outside. I am cuddled up under an afghan and watching “The Fifth Element” again – it is such a funny movie in a lot of ways. Big Badda Boom! Still, my favorite part is the Diva – beautiful, beautiful . . . Enjoy the video, and if you haven’t seen it, the movie is a hoot. it’s time for me to go back to work!